Tell Me, What Do People Thank You For? I’m a huge believer in gratitude. It’s actually had a huge, transformative impact on my life in the last several years, and gratitude makes its way into my writing with great frequency. Every morning I practice rituals – savoring a cup of coffee quietly, listening to the birds outside; setting silent intentions for the day; writing daily pages in my journal, always punctuated by five, detailed things that I am grateful for. Oftentimes, my gratitudes are somewhat repetitive, but I find comfort in that. It’s my time of self-reflection, of noticing the ordinary things that bring me love and beauty and safety. My gratitudes are oftentimes balanced by what Anne Lamott refers to as “the three essential prayers”: Help, thanks, and wow. The results are truly amazing. I’ve been working diligently on paying attention in the last few years, especially since I realized that my time at home with my teens was ticking down. I so agree with Lamott when she juxtaposes a life without gratitude as one that scratches and leaves us parched with living in a space of thankfulness, where the world around us shimmers with color and brilliance and just plain ordinary extraordinariness. I suppose that this practice of intentional gratitude is what made Lindsey Mead’s post catch my eye the other day. Titled “What do people thank you for”, Lindsey shares her discomfort with her perceived self-indulgence of flipping this idea of gratitude back onto herself. I share that uneasiness – as a mom, a teacher, a wife, I wouldn’t necessarily say I enjoy the parts of my life that simply are thankless – but I do have a certain acceptance of them. People thank me for cooking and baking and sharing meals with them. As a mom/wife, I fill this role with frequent happiness and without question, but I now realize that when I share my love of food, the love comes back. People thank me for writing about things that they cannot. I started this blog five years ago to help understand my changing life, to help share my feelings about aging and parenting and teaching and loving. I never, ever imagined that other people would react with gratitude when they read something that resonates strongly with them. People thank me for teaching. Whenever I answer the question “What do you do” with “I’ve taught middle school for the last 25 years”, the most frequent response is “Oh my goodness, I don’t know how you do it. Thank you.” Honestly, that response makes me smile every time. Teaching middle school is like breathing to me – I adore working with my crazy, puberty laden, self-conscious, silly and mostly lovable students. And when people respond, “You are a saint”, I smile, too. Recently, my students wrote reflections of the year that thanked me for a variety of different experiences they had in my classroom. The one that made me tear up the most was the one that thanked me for ‘never giving up on him’. I never, ever take students’ thanks for granted. Writing this post created internal discomfort, to be sure. It’s much easier to write about my own gratitudes; like Lindsey, these things that others thank me for create discomfort and make me wonder why I’m being thanked for them- because these are the moments and experiences and ordinary parts of my life that fill me up and that I can’t imagine living without. Family. Writing. Teaching. Students. I guess I know what tomorrow’s entries in my gratitude journal will be. So please tell me, what do people thank you for? Thanks Lindsey- yes, important to consider most definitely. Like you, the things people find worthy of thanking me for are things I do because I love to. Makes one think, doesn’t it? Thanks for your inspiration. The emotions and love that leap out out of this post touched my heart, Jennifer. 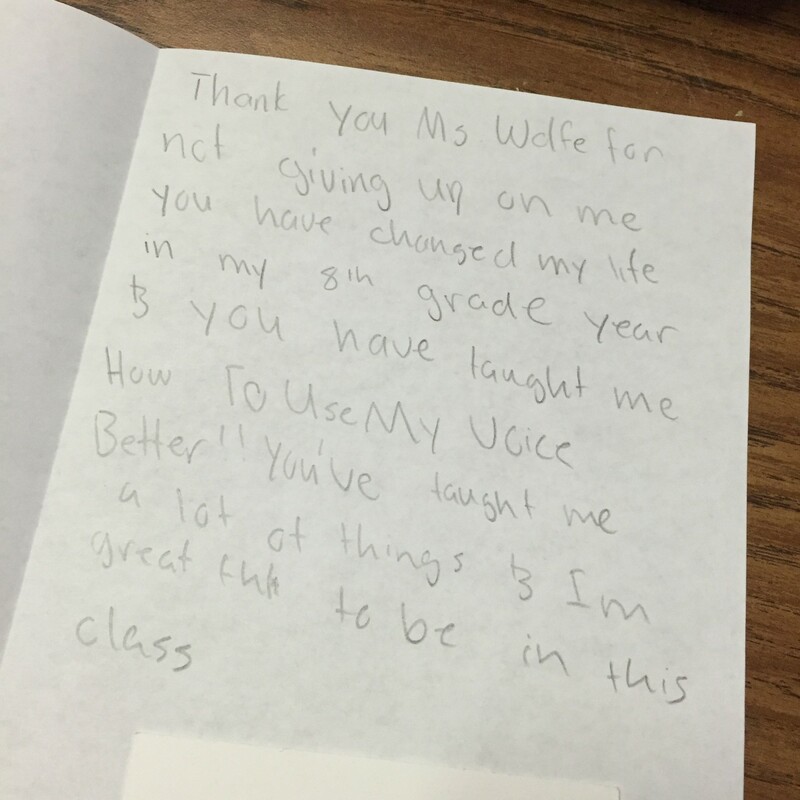 There is nothing above the loving words of students, which seems gratitude but that is the true voice of their heart. Balroop, thank you so much for the lovely comment. I’m so happy you connected with my post – I absolutely love the times when I get to see the gratitude first hand! So glad to hear from you, take care. OUR Children - Do You Hear Them?